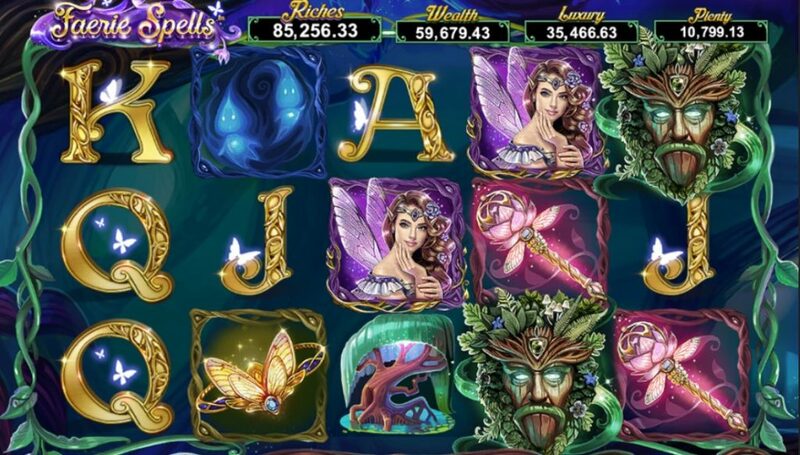 There is a touch of magic on 5 reels of action in this 10 payline shared jackpot slot Faerie Spells powered by Betsoft. It truly is a captivating game, rich in colour and gameplay alike. As a highly affordable game which offers four types of jackpots, this 2019 title is bound to be a timeless hit. Faerie Spells is all about free spins which will transport you into the magical realm where Jackpot Reels lead you to magical riches. This game’s allure is hard to resist and if great graphics and enchanting soundtrack do not pull you in, the gameplay definitely will. Played from as little as €0.10 per spin and up to highly affordable €10, this medium volatility product on top of all thrills found within gives you a chance to double your base-game wins or buy your way into the feature if you are not ready to wait it out. HOW TO PLAY Faerie Spells? Dare to follow the light into the enchanted forest and you will definitely be rewarded for your bravery. Betsoft has once again did a great job to create a neat-looking game with a silky smooth gameplay packed with plenty of engaging options that will be enough to keep you around for quite a while. Five reels are packed with magical symbols with the likes of dragonflies, magical tree guardians, pixie princesses and faeries populating the reels, along with a magic toadstool (carrying its own prize value) and a forest deity Wild, which substitutes for all other symbols except the Fairy Queen and the Diamond Scatter. Betsoft have overdone it a bit in terms of gameplay as during the game’s free spins you get to play with an entirely different set of symbols – presented as Faerie Queen’s precious possessions: coins, gold bars, diamond rings. In case you get confused and perplexed by the elaborate symbol set-up, don’t get discouraged just yet. Faerie Spells is a wonderfully easy game to play and we have Betsoft’s meticulous attention to detail to thank for it. A mere look on the initial screen is enough to reveal quite a bit about this game. It comes with a wide range of available bet values – going from €0.10 to €10. This alone is enough to entice a wide playing audience. Furthermore, we see that Faerie Spells comes with an AutoPlay button which is a welcome addition, along with a highly popular Double Up button. We’re sure you all know what this feature does. Whenever you line a winning combination during the game – by matching at least three identical symbols on a payline from left to right – you are given a chance to double your winnings by tossing a coin and guessing between Heads and Tails. Best thing about it is the fact you can either gamble with the entire amount you won or split it in half. Betsoft has made Faerie Spells as visually appealing as engaging. It boasts a gameplay packed with exciting features that will bring plenty of fun as well potentially whopping rewards. The fun starts with free spins and works its way through to four different jackpots. Faerie Queen Free Spins – this feature is activated once players land at least three Faerie Queen symbols. In this feature, the regular 10 payline engine transforms into a 1,024 winning ways mechanic which obviously boosts your chances of winning. You can get 10, 15 or 25 free spins depending on the number of triggering spins. Free Spins Realm to Win – the Scatter symbols only appear during the Free Spins feature, transporting the game to the Magical Realm with scatters exploding and the Faeries Queen activating magic toadstool. Diamond Scatters appearing on the reels will not only grant you a coin win but they will also explode and make way for new symbols to fall into place, thus allowing you to form new winning combinations. As for the Magic Toadstool, it appears carrying a certain cash value which is a bonus amount released every time a Faerie Queen is found adjacent to this magical symbol. Faerie Queen Jackpots – there is much more going on during the Faerie Queen free spins as these also take place on Jackpot Reels. There are four different jackpots in total to be activated. They all have their own trail with each symbol representing the jackpot advancing the trail. Jackpot symbols will further on be removed from the reels with new symbols dropping to replace them and new wins being calculated. The trails will be reset to zero at the end of the Free Spins bonus round. Betsoft has created a world of its own with the Faerie Spells video slot which takes players through a magical forest and into a special playfield. This 5 reel game offers 10 paylines initially with the number growing to 1,024 winning ways during the free spins bonus. This game is powered by Betsoft’s signature shared jackpot feature which challenges players to get potions vials and collect drops of the magic liquid which further contributes towards one of four jackpots. The impatient ones could even buy their way into the special feature to trigger the maximum number of free spins on demand for a price thanks to Betsoft’s unique ‘Buy-In’ option. Players, we need your help with how we should to rank and rate these reviewed casino games. You can help us by rating this game, and if you really enjoyed playing Faerie Spells. You can also share it with your friends on Facebook, Twitter and via email. For all freeplay games, if your free credits run out, simply just refresh the page and your balance will be restored.